ant512 rilascia una nuova versione del suo pseudo-sistema operativo dall'interfaccia simile a quella dell'AmigaOS. L'autore sta cercando (tramite l'uso delle PALib) di creare un sistema a finestre da poter integrare facilmente negli homebrew DS, al fine di facilitare notevolmente la vita dei programmatori nella realizzazione di interfacce grafiche. - Pointer to selected day button in calendar resets to NULL when new month selected; prevents day button incorrectly popping up if same button is clicked in new month. - Calendar::getPreferredSize() returns valid values. - Label text is greyed out when disabled. - Huge speed increase in Calendar::resize(). - Calendar's child controls correctly fill entire available space. - Calendar correctly selects date if new day is the same as old day but in a different month. - Gadget drag event only raised if stylus is actually moved whilst dragging mode active. - ScrollingPanel drag and scroll events only raised if stylus is actually moved whilst dragging mode active. - MultiLineTextBox greys out text when disabled. - MultiLineTextBox::removeText() correctly repositions cursor. - TextBox greys out text when disabled. - SimpleScreen and SimpleWindow helper gadgets removed. - Renamed LinkedList to WoopsiLinkedList and LinkedListIterator to WoopsiLinkedListIterator to avoid type clashing with LinkedList in devkit. - SuperBitmap::getBitmap() returns a pointer to the Bitmap object instead of the Bitmap object's raw pixel data. - Moved skinned gadgets out of main library and into bonus folder. - Removed fatInitDefault() stub method for SDL out of individual .cpp files and into nds.h. - Graphics::drawBitmap() clips correctly if bitmap destination co-ords are greater than the size of the destination bitmap. - Replaced DMA_Force and DMA_Copy with woopsiDmaForce() and woopsiDmaCopy() to fix ancient problems with DMA not seeing latest RAM state. - Added an overload to GraphicsPort to print a length of a string in a specific colour. - Restructured directories into traditional library layout. - Upgraded main project to VC++ 2008. - Added libwoopsi.a to SVN. - Added template example that uses libwoopsi. - Reorganised demo code into new demo directory. - BitmapIO class can load 16-bit BMP images with any pixel encoding. - BitmapIO class can load V3, V4 and V5 DIB headers. - BitmapLoader example illustrates loading of most supported BMP types. - Added skinned gadget example. - Added SkinIO class to bonus folder - loads skins from disk. 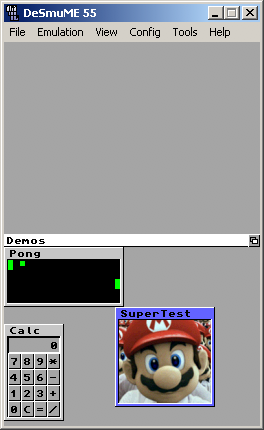 - Added BitmapBase class to define basic interface for a bitmap. - Added BitmapWrapper to enable included (not loaded) bitmap data to be used as a read-only Bitmap object. - Moved drawing code out of Bitmap class into new Graphics class. - Added MutableBitmapBase class to define basic interface for an editable bitmap. - Added FrameBuffer class to wrap framebuffer inside a bitmap class. - All references to DrawBg array now work with frameBuffer array. - Added GraphicsUnclipped to perform raw unclipped bitmap drawing. - GraphicsPort inherits from GraphicsUnclipped in order to reduce code repetition. - Font system uses new Bitmap object hierarchy. - System fonts available as global objects. - Rewritten clipping routine in Font and MonoFont. - Reorganised VC++ project with more filters. - Rect struct moved out of Gadget class and into separate header. - SuperBitmap no longer includes drawing functions; instead it exposes a non-const pointer to its bitmap and a non-const pointer to a Graphics object that can draw to the bitmap. - Added blit() and blitFill() methods to Bitmap and FrameBuffer, and signatures to MutableBitmapBase. - Added getData(x, y) method to all bitmap classes.